How do you do it? Where do you get the disc? I play star stable but I sort of want to play this too. I don’t want to play this. Sounds cheesy. I would rather play SSO. I’ve played the game before, but then deleted it. Is it possible to download it from somewhere, or do I need to find a CD copy of it somewhere? I recommend you purchase the disc. I bought all of mine for less than $5 each on Amazon. They’re not too hard to come by. Are used games on amazon good? Hi!! I was looking on Amazon and it had it for 23$$. Do you think they come up on it higher? Check the listing for used copies. Those are usually cheaper than brand new. What if you can’t buy anything online or can’t afford it? It’s very good. They’re short, but still enjoyable. They offer some good back story to the Soul Riders and their powers. And a little bit of story about Dark Core and Mr Sands as well. never played so i don’t know? They are actually very fun and though I played them when I was 7-10 years old I still think they were pretty fun. There are four different games and in all of them you are a different girl of the four, Either Lisa, Linda, Alex or Anne. They all have different horses and different quests that go along with them. 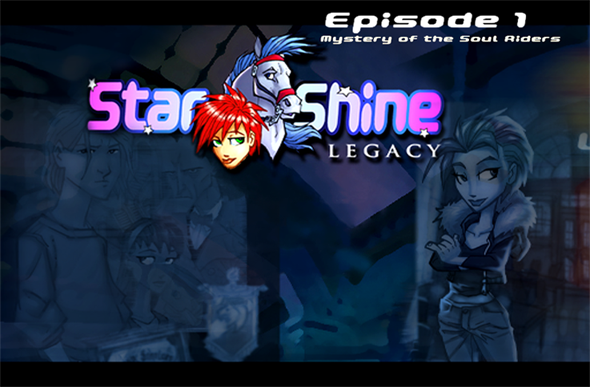 There are four games in Starshine Legacy, to answer your question. If their are four games then what are they all about? Like for the Star Stable discs, they are about the four different seasons but the same with racing and everything else… Is that kind of what this is or no? You play as each Soul Rider in the games. First is Lisa, then Linda, then Anne and then Alex. Each game has a different plot, mostly about Dark Core. What OS do you have? I have a new computer that’s less than a year old and runs Windows 8 and it works fine for me. but does it work on windows 7 desktop? Is Starshine like an older version of Star Stable? I looked at a few images online and it has similar graphics and areas. In another pic it shows Sabine. The horses sort of look like the horse near the zombie pole bending course near Valedale Lake, the one with the red mane. I noticed it also has Linda. Is it by the same people? It is. It is made by the same company, about 2008, and then they went on to make the online game. there isn’t a hyperlink for the next chapters! This is very cool game…AND this is the best blog i have ever SEEN! i had been waiting for help in sso from my friends and now i can see it from here c: really thx THIS IS THE BEST BLOG GUYS!! Oh, I remember playing this in 2007 (And the other Starshine games as well). I was so happy to see characters from Starshine in regular Star Stable games and then in Star Stable Online. It was like seeing an old friend after a long time. i cant find the game to download, where can you download it? You need to purchase the disc to be able to play. It is not an online game. They sell pretty cheap on Amazon. That is where I got all of mine. I want to to play this game so bad! I’m just afraid they won’t work on my computer and I don’t want to waste money 😦 Do you know of any ways I can know that it will work? I bought my new computer last year (it has Windows 8) and all Starshine games work perfectly fine. I’ve had absolutely no problems. Unless your computer is very old and/or full of stuff, I think it should work. I’ve tried Starshine games with my older computer (Vista) and they’ve worked well with that as well. It should. If you can run SSO then you can definitely run the Starshine games, as the SSO minimum requirements far exceed those of the Starshine games. I want to get the starshine games but I can’t seem to find them anywhere but ebay and I’ve had problems with ebay recently so I don’t really want to buy them from there. Does anyone know where I can get them in the UK? It is a PC game you have to purchase the disc for. I found all of mine on Amazon and Ebay. is it a website or something? Or do i need to download it. Or do i need to buy a CD copy or what? Has anyone tried playing them on a Mac? I have a brand new MacBook Pro, so I doubt it would work, but sometimes PC games do. I am not sure, I can check the basic requirements for you if you would like. I honestly don’t know anything about PC vs Mac so I wouldn’t really know. do it exist starshine in mac version?? I have this game but it was for PC so now I cant play it, and I really miss playing it. Please awnser! I’m not sure, I don’t think so though. The game is pretty old. I bought all of them on Amazon and Ebay. how do you start playing ?? You need to purchase the discs to be able to play. I have a question. Why can’t I see Chapter 7? Is it locked or something? I haven’t posted that part yet. I bought the CD Starlight Legacy and it does seem to work on my PC Windows 8. Can anyone help? Thank you. How do I open the cell phone? I have tried using the page up/down like it says to, but nothing happens. You need to purchase the discs. I bought all of mine on Amazon. Where could i find ‘Jorvik Dance Academy’? It is a pc game. You have to buy they disc. Until recently, Star Stable would not run on our brand new win 10 system. SS made major changes to its game and we can play now! My question is, will we run into compatibility issues trying to run the four chapter games on our computer? Thank you! Any downloaded copies would be pirated and i do not recommend nor endorse doing so. Can you use it and play it on a macbook pro?